Dragon's Crown is the new action RPG/ side scrolling beat em up from Vanillaware, the makers of the always beautiful games like Odin Sphere and Grand Knights History (well, at least in Japan), and brought over to the U.S. thanks to Atlus. To get the full effect, I dived into the single player and co-op after enlisting my wife. First off, the game looks amazing. 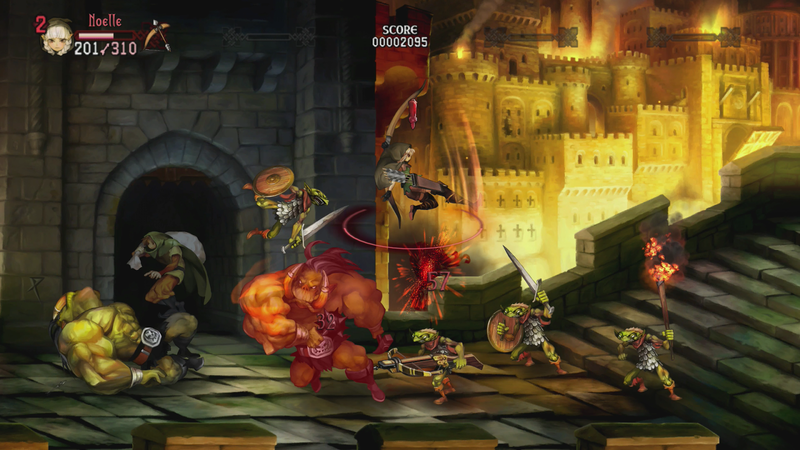 If you are familiar with the normal look of Vanillaware games, you know what to expect. The character graphics look wonderful, both the larger pictures and the in-game models. The scenery and enemies are just as good. There's plenty of pretty spell and attack effects, and the whole thing looks great. The animations for all of the characters is just as fluid and good looking as everything else. A personal favorite of mine is the Dwarf's animation for riding a mount (he's such a BOSS). The only real drawback to the overall look of the game is that there is too much going on the screen at times, and I lose track of my character. It takes me a few crucial seconds to figure it all out and by then I've already taken damage. It's not limited to me either, as my wife had the same problem, especially when trying to locate her weapon after an enemy knocked her down. The controls are pretty much spot on. Square will do your normal attack/combo, Triangle will pick up or drop items/weapons, Circle will do your special move, X will jump (and double jump) and R1 (R on the Vita) will dodge. The d-pad is used to select and use equipment (heal potions and special abilities) while the right analog stick is used to move a cursor around the screen, which will be mentioned more in a bit. It's really cool that the Up and Down directions with the attack will do different attacks and magic spells, although I sometimes do these when I don't intend to because of how I play side scrolling beat em ups. One thing control wise that bothers me is the lack of a pause. I figure that because you can play online, there is no pause, but when I'm playing solo or couch co-op, I really, really want to be able to pause. Kids can't always wait for enemies to be cleared out or a boss to die. The vertical range of some attacks seems limited too, and I sometimes had trouble hitting guys because they were a hair above what I thought I could hit. These screenshots are so pretty I just uploaded the large version. Back to the cursor mentioned earlier. There are treasure chest and doors that can be unlocked by the rogue that follows you around so you can get weapons, gold and access to secret areas. You can tell the rogue to unlock them by putting the cursor over them and clicking it down or pressing the L Button. In addition to the chests and doors, there are quest items to click on and little sparkles that will reveal more treasure when clicked. There's also runes carved into the background that can give various effects when you complete certain groups of three. All of these are far easier on the Vita, where you can just click the touch screen. The cursor works well enough, but sometimes hangs up on the runes and other things when you are trying to move past them. It's also easy to lose the place of your cursor, so it's not easy to use in a fight, where some of the runes are actually useful ("petrify the flesh", I'm looking at you). There are six different characters to choose from: Fighter, Amazon, Dwarf, Sorceress, Wizard and Elf. The Fighter and Amazon can block attacks, and are best up close. They are fun but standard characters and can do lots of damage consistently. The Dwarf is also good up close, and can pick up enemies and throw them. The AI Dwarf does this with abandon, so beware (it is a lot of fun to do, though). The Sorceress and Wizard can use several different magic attacks that are dependent on the element of their weapon. They also get several skills that require you to carry items in their inventory, so you'll want to decide which to take so you can still equip things. The Elf has lots of close range kicks, but can stay at a distance and use her bow. They are all fun in their own way and I like that the similar ones have skills that make them play different enough from each other. Each character has several different colors to choose from, most of which are pretty cool. I first started out with the Sorceress (gee, I wonder why? ), but found the Elf and Dwarf to be the most fun after awhile. Also, while the drawback of the ranged characters is limited arrows or recharge-able MP, the close range fighters can drop their weapon. Sometimes it's from doing your strong attack and most times it's the enemies knocking it out of your hand. I'm guessing it's a balance thing, but it is pretty annoying to have to track your sword down after taking a huge hit. I'd easily recommend trying them all and see what skills you can buy with each before committing to one. 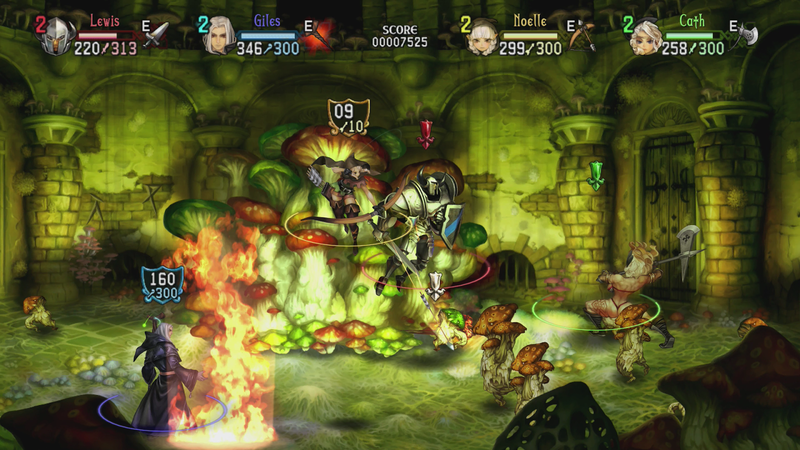 Throughout the story of Dragon's Crown, you will take on a variety of quests and travel to 9 different dungeons. There is actually a story to the game. It's not very long, but I like that it's concise. Really, though, it's a great excuse to go and kill some monsters (and look at cool pictures of the different characters). A few characters are obviously inspired by other famous fantasy series, and there's even a Monty Python reference or two for good measure. No, I won't spoil it for you, but it is pretty funny. There are lots of quests that will send you back into the dungeons, which helps get you more money and experience. You can get some more exp, money and even skill points for doing these quests, but the best rewards are the artworks. Each quest has an unlockable piece of art. There's a few that I want to use as new Vita backgrounds! After conquering the 9 dungeons, something interesting happens. Online co-op becomes available! However, that's not all that changes. If you don't want to know, just skip past this paragraph now. Anyway, you must then get 9 talismans from alternate paths through the dungeons that have opened up. These include new bosses that must be beaten fairly quickly to actually get the talisman. I do like that there are alternate paths and new bosses to fight, as it adds some good replayability and choice when going through them several times. I'm not too crazy that they jump up in level and can require some grinding to be able to beat in the time required. The previous bosses all get a level increase too, so you aren't just slaughtering the first few. The other change I'm not too fond of is that you have to pay to be able to choose which dungeon you go to. You can go to a random one for free, but have to front up some gold to choose. Yes, they actually put a reason in the game as to why you can no longer choose for free, but it still feels like a very unnecessary change to have in the game. Since this is primarily a multiplayer game, you can enlist AI characters to help you while playing solo. If you recover bones in the dungeons, you can have them revived for a fee and they become available to join in your adventures. This is a neat function and can make some of the dungeons and bosses a little easier. If you don't choose to take some along, they can randomly join midway through a dungeon, which is kind of nice. This can be turned off though, so you aren't stuck with them. The biggest drawback to this is the AI itself. They routinely walk though traps and don't try to avoid taking attacks that can outright kill them. Sometimes they just stare at the boss while waiting for you to come back after losing a life. If they run out of lives and you don't pay to bring them back, they are gone for good. They don't level up, and are in plentiful supply, so it's not that big of a deal. They are ok, but definitely no substitute for another person. As mentioned before, I played a lot of the game in couch co-op multiplayer. Thankfully you do not have to beat the 9 dungeons to open that up. It works really well. You share the same bank (with an awesome 500 slots!) and can take the same quests offered. The biggest downside is that only player 1 gets credit for doing the story quests. You still get all the exp, so you can breeze through the story mode with that character for completion. The other downside is player 2 cannot activate any runes, since they won't have them in their inventory. This may change if that character is far enough in their story, though. Lastly, I didn't have a chance to try online, since no one joined my games (and I didn't seem to join anyone else's), which isn't surprising considering the game isn't out yet. I'll update accordingly once I get in a few games. Ice staff = ice and wind magic. Atlus claims that it will take about 20 hours to go through the game with one character. This fell in line with my own experience. My clock was higher, but I also tried all of the classes at least a bit, and the clock is for the whole file, so naturally it had more time. I imagine it is much quicker once you know the tricks to the bosses for subsequent characters. The length seems a bit forced because you travel to each dungeon a few times for quests and whatnot, but the different routes is at least a nice change of pace. There's also three difficulties, and completing one will open the higher one. There's also six characters to try out. I like the amount of content in the game and think it's a great value. If you have someone to play with, it's even more so. Unfortunately, the game is not cross-buy, but thankfully you can easily transfer your save file between the PS3 and Vita versions if you have them both. It's actually a main menu option, so use it often. Heck, you could even use it as an easy cloud storage option if you only own one version of the game. The game auto-saves, so it can be used as a nice backup save, or just use it to copy the save file into the other save slots. The trophy list is shared between the Vita and PS3 version, so no double dipping. There's a few standard trophies, like completing each dungeon, beating the game with each character and getting all the awesome artworks from completing quests. There's some for doing various things like burying bones, donating coins to the goddess and the like. Lastly, there's a few 'mastery' ones, like getting a high score, maxing out the level and beating the final boss really quickly. It's a nice list that is spread out so you can get trophies along the way, not like some games that give you a lot in the beginning and at the end. Overall, did I have fun while playing Dragon's Crown? Yes. Was it even better to play with my wife for some couch co-op? Indeed. She was looking forward to coming home each day to play some more, so it wasn't just me having lots of fun. There were a few frustrating parts, like the jump in difficulty halfway through the game, some of the bosses, and the AI. There's a little bit of grinding, but the combat is really fun. It's a little disappointing that you have to beat the 9 dungeons before you can play online, but if you have a buddy that can come over to play, that won't matter as much. The Vita version has the advantage of touching the screen instead of using the cursor to activate things and order the rogue around, but the PS3 version has the advantage of couch co-op. If you like action RPGs or side scrolling beat em ups like the Dungeons and Dragons arcade game or the old Double Dragon games, Dragon's Crown is one to try out. Wow, that's a lot of dragons, huh?